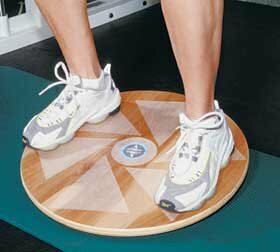 Wobble and Rocker Boards include removable 5" polyurethane sphere with 3/4" spacer for varied difficulty. Tilt angle 13° to 22°. Advanced for higher-level patients and athletes: without spacer, max angle 15°, with spacer it's 22°, Intermediate for beginner and intermediate, without spacer, max angle 13°, with spacer 16°. Rocker Board max angle 16°. Birch grain finish. Clear 3MTM nonslip surface. Two-year guarantee. This Listing Is For Rocker Board, Square, 20"